Didn't think LG was going to let the competition have all the fun with their flagship launches did you? Today they unveiled their 2015 flagship phone the LG G4. Visually with this flagship LG is taking its well known and well received G3 design and give it subtle tweaks, including design cues from its experimental G Flex Line, to make its own. As it is a flagship device, it's sporting some pretty impressive specs including an Octa Core Qualcomm Snapdragon™ 808 Processor, a 5.5-inch Quad HD IPS Quantum Display at 1440p and 538ppi, 32GB of internal storage expandable via microSD slot, 3GB RAM, a 16MP F1.8 Aperture camera with Optical image stabilization + a front facing 8MP camera, a 3000mAh removable battery, LTE connectivity and Android 5.1 Lollipop. Colours offered in Canada include Ceramic Metallic Gray and Genuine Leather Black. Canadian availability is expected in June from Bell, Rogers, TELUS, Videotron and WIND Mobile. Check out the official press release after the break. TORONTO, April 28, 2015 — Beginning this June, Canadians can get their hands on the eagerly anticipated LG G4, LG’s latest smartphone and the successor to the award-winning LG G3. Globally announced today, the LG G4 will be available this summer through Bell, Rogers, TELUS, Videotron and WIND Mobile. With the G4, LG focused on delivering comfortable elegance, a great visual experience and a human-centric user experience. The LG G4 camera features a rare-in-smartphones F1.8 aperture lens which allows 80 per cent more light to hit the image sensor than in the LG G3. The innovative camera module is paired with the new IPS Quantum Display that is better in every way than the innovative Quad HD display introduced to the world in the LG G3. The LG G4 embodies human sensibility that is clearly visible in its Slim Arc exterior design and graphical user interface. LG paid special attention to the materials utilized in its newest flagship. 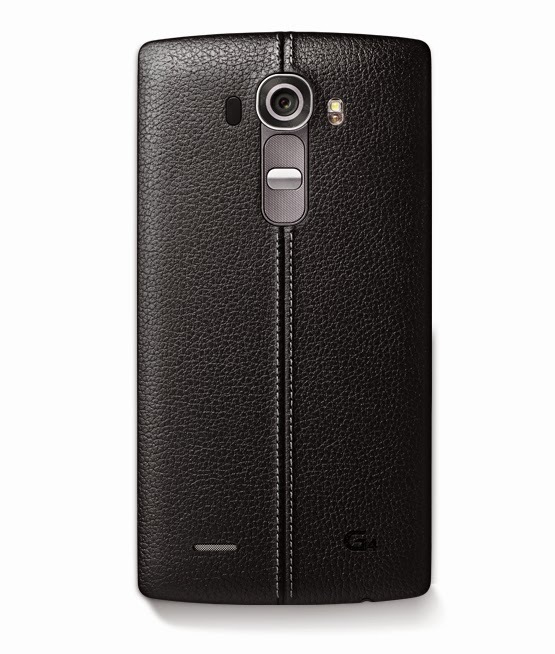 The LG G4 is available in handcrafted, genuine full grain leather. The vegetable tanning process employed is an age old tradition that requires skilled craftsmen to produce and dye the leather. The colours of the leather on the G4 are rich with warm tones that look authentic and change over time. Most importantly, vegetable tanned leather is environmentally friendly and can be recycled easily, since no harsh chemicals are used. Other material options for the G4 rear cover include an artisan-forged Metallic Gray. The fashionable elegance of the LG G4 is a refreshing change from the uniformly flat, full metal designs that have been become standard across the industry. The LG G4’s design is defined by the Slim Arc, which runs along its entire body, highlighted by a display with a subtle curvature. More than just a design accent, Slim Arc offers 20 per cent better durability than a flat smartphone in face-down drops and gives the smartphone a more comfortable and secure feel in the hand. The exterior design is also reflected in the smartphone’s user interface, which includes simple, naturally intuitive graphics. In the LG G4, the icon colours are more vibrant with icons that have rounded corners, consistent with the Slim Arc design. What’s more, the Smart Notice widget automatically changes its background and text colour based on the home screen image selected by the user. LG designed the 16MP camera in the LG G4 to capture beautiful images, even under less than ideal lighting conditions. The camera module features a wide F1.8 aperture lens that allows 80 per cent more light to reach the sensor. LG improved low-light performance even further with OIS 2.0, which doubles the performance of the improved OIS+ by expanding the range of image stabilization from one degree to two degrees on the X- and Y-axis and adding a third axis for the first time. The advanced camera in the LG G4 is complemented by Color Spectrum Sensor (CSS), the first feature of its kind to find its way into a smartphone. CSS improves colour accuracy by precisely reading the RGB values of the ambient light in a scene, as well as the infrared light reflected from objects. CSS uses this information to adjust the camera’s white balance and flash colour to create images that are as close to what one would see with the naked eye. With Color Spectrum Sensor, no longer will reds appear as bright orange or whites as dull yellow. Taking a quantum leap in display technology, the LG G4 is the first smartphone to use LG Display’s new 5.5-inch IPS Quantum Display, which offers 20 per cent greater colour reproduction, 25 per cent improvement in brightness and 50 per cent greater contrast. It is the first Quad HD display to employ Advanced In-Cell Touch (AIT) technology, which combines the LCD and touch sensor into a single layer to provide better colour reproduction and touch sensitivity. This new display is calibrated for DCI (Digital Cinema Initiatives) standards for colour expression, championed by top Hollywood studios. With G4, the higher quality display doesn’t come at the expense of battery life. The LG G4 is equipped with a high-capacity 3,000mAh removable battery, a rare feature in today’s high-end smartphones. Combined with the benefits offered by the snappy yet energy-thrifty Qualcomm® Snapdragon™ 808 processor, the LG G4 has no trouble getting through a full day of normal use. · Quick Shot allows customers to take pictures without opening the camera app by double tapping the phone’s Rear Key while the display is off. LG G4 also has an incredibly fast camera startup time of just six-tenths of a second. · The new Gallery makes it extremely fast to scroll through thousands of pictures and view them on a timeline. The Memories feature automatically organizes photos and videos into event albums based on the time and place they were taken, without having to upload to the cloud. · Event Pocket allows users to create one, unified calendar by dragging and dropping appointments and activities from multiple calendars and social media sites. After the initial setup, there’s no need to log into multiple calendars. · Quick Help allows users to search for instant answers to any questions about operating the LG G4, right in the Smart Notice widget. Quick Help can guide users through the LG G4’s settings and even schedule a call with customer service. * Specifications may vary depending on the market.